Ashmolean Museum Announces SPELLBOUND MAGIC, RITUAL & WITCHCRAFT Exhibit – Zero Equals Two! “The Ashmolean’s autumn exhibition explores the history of a fascinating cultural phenomenon – magic. SPELLBOUND will display 180 objects from 12th-century Europe to newly commissioned contemporary artworks. They range from the beautiful and mysterious (crystal balls, books of spells), the bizarre and macabre (a unicorn’s horn, a human heart encased in lead), to the profoundly touching (the testimony of women accused of witchcraft, the lovers’ padlocks cut from Leeds Centenary Bridge). The exhibition explores the inner lives of our ancestors, offering an insight into how people in the past actually felt and what they did to cope with the world they lived in. Looking at human hopes, fears and passions and asking visitors questions about their own beliefs and rituals, the exhibition aims to show how, even in this sceptical age, we still use magical thinking and why we might need a bit of magic in our lives. “SPELLBOUND will be a dramatic and unsettling experience. Specially commissioned works by contemporary artists (Ackroyd & Harvey, Katharine Dowson and Annie Cattrell) will provide evocative responses to the themes of the show, conjuring demons, flames and unnerving noises. People will encounter six objects and six questions which challenge the extent to which we still think magically. ‘Do you have a lucky object?’ is linked to a carved coral brooch (17th/18th-century) of St Michael defeating Satan – an image of good triumphing over evil made in a material believed to have protective properties. ‘Could you stab the image of a loved-one?’ is asked next to a Chinese wax figurine pierced with pins. One of the most famous objects is a silver flask from the Pitt Rivers. It was obtained in 1915 from an old woman who lived in Hove, Sussex who remarked: ‘they do say there be a witch in it and if you let un out there it be a peck o’ trouble’. To our knowledge, it has never been opened: people can contemplate whether they would dare. Visitors can then enter the exhibition, if they choose, by walking under a ladder and the museum will monitor how many are happy to tempt fate. “The exhibition opens in the medieval cosmos, a place swarming with spirits and supernatural currents which affected everything from an individual’s health to an army’s triumph. In this precarious world where mass disease, death in childbirth and warfare were features of everyday life, magical interventions offered people a sense of control over their fate and a means of relieving anxieties. Magical enquiry also had intellectual respectability. By the end of the 14th century physicians in many countries were legally required to calculate the position of the moon before they performed operations. There were many well-known university magicians and astrologers including Oxford’s Elias Ashmole whose clients included Charles II. Perhaps the most famous magician in England was John Dee who advised Elizabeth I. 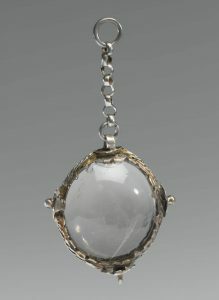 A tool in his armoury, featured in the exhibition, was a beautiful purple crystal ball which was used to invoke a benevolent spirit or trap an evil one. He claimed the crystal was given to him by the angel Uriel in November 1582. “Despite the risks (and clerical opprobrium), in times of stress and heightened emotion evidence of people resorting to magical intervention abounds. There was no subject more important than love, especially unrequited and frustrated love. Hundreds of magic rings, seals and brooches survive, engraved with mottos and lines from famous romances with words ranging from hope (‘Joy without end’) to warning (‘Desire no other’). They were intended to bind another person with an appeal to supernatural power. The ritual has been revived in recent years by couples attaching inscribed padlocks to city bridges and throwing the keys into the river. The inscriptions on locks from Leeds Centenary Bridge include ‘I wanna lock your love’, ‘LOCKED + SEALED’ and ‘Be Mine’. While in many cases a merely symbolic gesture, the outcry at the removal of locks, in spite of the obvious problems they cause for structural engineering, and authorities’ reluctance to simply destroy or dispose of them, suggests that people attach significant emotion to the ritual. The locks might be considered as modern magic objects. “At the centre of the exhibition is a selection of the many thousands of items that have been discovered concealed in homes to protect them against mundane and supernatural threats. Dead cats were deliberately entombed in wall cavities in acts of ‘sympathetic’ magic to chase away vermin. Old buildings are full of enigmatic marks and symbols which have magical meaning such as the round ‘hexafoils’ on a pair of 17th-century barn doors from Suffolk. Witchcraft was considered one of the greatest dangers and thousands of concealed objects have been found in homes around the country and abroad, the result of rituals conducted by people known as cunning-folk, the formidable foes of witches. Some remedies were simple: horseshoes placed above doors, iron thought to repel witches. Others are more complicated such as ‘witch bottles’ placed under hearths and thresholds, the vulnerable points of the house where a witch might gain access. They contained urine, small sharp objects and human hair and nail clippings, possibly stolen from the supposed witch. Pierced animal hearts found in chimneys were placed there, in the beating heart of the home, to punish the witches who dared endanger life. Concealed objects are most often found during modern renovations and are frequently reinterred during the course of the work – probably ‘just in case’. Many of the objects on display come from private collections and the lenders have expressed their wish to have them back as soon as the exhibition ends so they can be returned to their finding places. “The exhibition closes with dramatic accounts of witch trials. Four-in-five suspects were women, many elderly dependents who made defenceless scapegoats. Methods of detection and punishment were cruel. The water ordeal or ‘swimming’ of a witch galvanized communities into initiating prosecutions. Margaret Moore’s is one of the saddest stories. She lived in Sutton-in-the-Isle, a village near Cambridge and had four children, three of whom had died. She confessed to a ‘witchfinder’ that she had made a pact with the devil, in exchange for her soul, to save her last surviving child. A magistrate recorded this ‘examination’ on 26 May 1647. An illiterate woman, Margaret signed with a crude mark. She repeated her confession in court and was hanged. “The last person tried for witchcraft in Britain was Helen Duncan (1897–1956), a Scottish medium and spiritualist who claimed to be able to conjure spirits draped in ‘ectoplasm’ emitted from her body. This was proved to be cheesecloth which she swallowed and regurgitated, while her spirits were props – dolls and photographs cut out from magazines. In the 1930s she was denounced as a fraud and in 1944 prosecuted under the Witchcraft Act of 1735 which forbade conjuring spirits. A six-month prison sentence made her a spiritualist martyr and led to the repeal of the Act in 1951.